Radicchio’s strong bitter taste and fading color when cooked, can take a cook by surprise. Here are a few tips that will help you use this versatile vegetable in your next great meal. Radicchio’s bitter edge adds flavor complexity to salads and cooked dishes. If needed or desired you can soften radicchio’s bite by soaking it in water for at least 20 minutes before serving. The amount of time spent in the water will control the intensity of the bitter flavor. 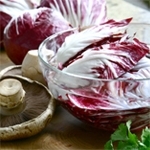 As an added bonus–soaking radicchio in ice water increases the intensity of its bright red color. Cooking radicchio brings out its natural sugars, creating a delicious new flavor profile. The heat of cooking also causes radicchio turns it a soft brown much like a caramelized onion. To preserve radicchio’s brilliant color in recipes in which cooking is required try this expert trick: Dissolve 1 tablespoon sugar or honey in 2 cups of hot water. Allow to cool and add ice to make ice bath. Boil equal amounts of water and white wine vinegar. Blanch cut radicchio in vinegar solution and plunge immediately into sweet icy bath. This not only preserves the color of raw radicchio but sweetens your radicchio as well. This entry was posted in Blog by admin.royalrose. Bookmark the permalink.